For years, The Excavators, LLC has been offering customers the most in excavating services. Because we understand that not every job is the same, we provide extensive services such as vacuum excavation. Some jobs simply require something different than the typical excavation that so many projects use, which is why vacuum excavation is a good choice for jobs that need a little more delicacy than others. As a family owned and operated excavation and directional drilling company that has been in business through three generations, we understand the needs of our customers and strive to place their satisfaction as our number one priority. Removing dirt around utilities. Larger excavation tools could damage and destroy the sewer, power, or water lines. With vacuum excavation, you will not have to worry that you will end up with a larger problem than you’ve already got. Although the suction is forceful, it will not be forceful enough to disrupt any utilities. Tight crawl spaces. Some jobs might require heftier excavation, but perhaps they cannot begin because the project is in a tight crawl space. Through vacuum excavation, the process can begin, and if needs be, larger equipment can come in when there is enough room to finish the project. In some cases, vacuum excavation would be the sole form of excavating because of the tightness of the space. Whether you have a large excavating job that just needs some extra delicacy, or if you have a small job that cannot be performed with typical excavating equipment, contact The Excavators, LLC for our professional Portland vacuum excavation services. 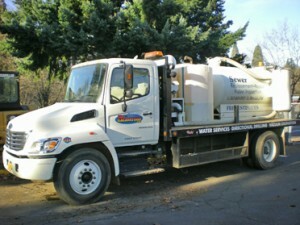 We’re more than Portland sewer repair experts, our equipment is of the highest quality to accomplish any excavating job you have, whether large or small. Whether you live in or around the Portland Metro area, let us take care of all your excavating needs. Contact us today at 503.869.0910 to get started on your job.